↑ 5.0 5.1 "Quelques données pour le Burundi" (French में). ISTEEBU. पहुँचतिथी 17 December 2015. ↑ Annuaire statistique du Burundi (PDF) (Report) (French में). ISTEEBU. जुलाई 2015. प. 105. पहुँचतिथी 17 December 2015. 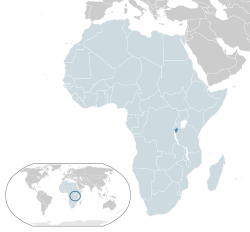 ↑ 8.0 8.1 8.2 8.3 "Burundi". International Monetary Fund. पहुँचतिथी 13 January 2015. ↑ "Gini Index, World Bank Estimate". World Development Indicators. The World Bank. पहुँचतिथी 13 January 2015.